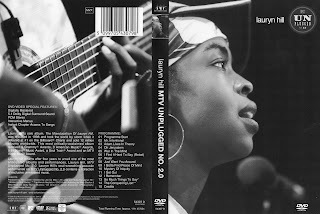 Lauryn Hill bleeds her heart out to everyone through this DVD. She inspires, motivates, and perpetuates inner thought. When watching this performance, one walks out feeling rejuvinated and re-evaluates society and your place in it. Inner demons seemed to haunt Lauryn Hill but obviously overcomes the tragedy of love, life, and forgiveness with oneself. She emates from what is raw and pure emotion which she uses her amazingly- beautiful rapsy voice and her acustic guitar. The music is only secondary as the message is the most thought- provoking passages I have encountered. Her performance of "I Gotta Find A Peace of Mind" is mind- altering, heart- dropping poetry of issues that we all deal with. Towards the end of the song, she cries and pours all her energy so she can get her point accross. The audience is left in tears as well as it is the most incredible sight one can be part of. Please, whether on MTV or through this DVD, just watch it and you will see a strong woman who overcomes everything and still can stand strong in the light of day.